Meets DLC 10,000 lumen and zonal light distribution requirements for high bay use. Uses a single high-powered LED chip with different reflectors and diffusers to suit different applications. One of the most efficient and cost effective LED High Bays on the market. Will last for 50,000 hours before 30% lumen degradation. Lxi bay lights integrate with smart lighting controls, eg. 'instant on' and occupancy sensors to effectively manage and reduce energy consumption. Awaken's Lxi is designed and tested to withstand wind gusts, vibrations and rainstorms. The Color Rendering Index (CRI) states how ‘true’ colors appear. Typically, HPS is 65 and Metal Halide is 70. Awaken’s Lxi has a minimum CRI of 70. Its bright, consistent overall light coverage eliminates shadows - closely emulating natural daylight with no glare - to enhance the passerby’s experience and safety. ETL and Design Lights Consortium. Design light Consortium listed, meets DLC 10,000 lumen and zonal light distribution required to replace 400W MHA. 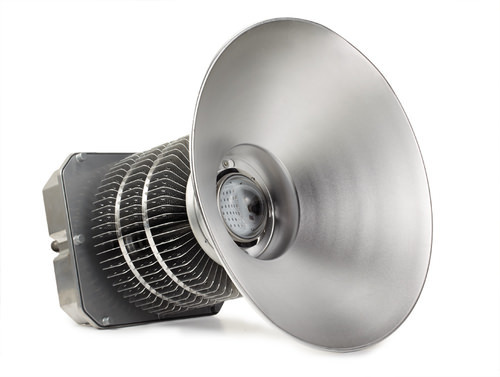 This revolutionary High Bay Light uses a single source 'array' LED, unique optics and electronics to replace any 400W MHA High Bay Light.